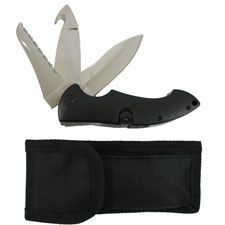 The Trilogy Rescue Knife is the first and only triple blade rescue knife. Three separate stainless steel blades give rescuers the option of a 3 smooth blade, a 21/2 blunt tip serrated blade or a combination of a 2 smooth blade with a seat belt cutter blade tip. All blades open easily with an indented thumb nail groove and lock in the open position for safety. Trilogys high impact plastic handle features push button closure tabs for all three knives. It comes complete with a special design holster which can be worn horizontally or vertically. Length open 7-1/2". Length closed 4-1/2". Approximately 10 ounces.